Almost fifty years after the Doctor first crossed the small screen, he remains a science fiction touchstone. His exploits are thrilling, his world is mind-boggling, and that time travel machine—known as the Tardis—is almost certainly an old-fashioned blue police box, once commonly found in London. 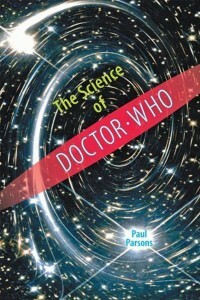 Paul Parsons’s plain-English account of the real science behind the fantastic universe portrayed in the television series answers such burning questions as whether a sonic screwdriver is any use for putting up a shelf, how Cybermen make little Cybermen, where the toilets are in the Tardis, and much more. I am not a science person. In my years of schooling, I never once came up with a non-lame idea for a science project and was positively abysmal at experiments. I did pretty well on tests and homework, but if someone’s test tube was going to spontaneously erupt in a geyser of brown froth (true story! ), it would be mine. Suffice it to say, then, that while I enjoy science fiction entertainment, it’s not because of the science. Still, The Science of Doctor Who promises “a plain-English account of the real science behind the fantastic universe portrayed in the television series,” so I reckoned on being able to follow it. Alas, Paul Parsons’s definition of plain English is a bit different than mine. I was okay with the majority of the material. Chapter topics include the Doctor’s recurring foes, regeneration, gadgets, weapons, space stations, force fields, parallel universes, and more. In general, Parsons would start by mentioning something that happened in a particular Doctor Who serial and then interview renowned scientists as to whether this is actually possible. Most of the time the answer is “no” or “only with extreme amounts of energy/effort,” but there are a few things that are not so far off. The chapters on alien worlds (Lots of planets really do have a north!) and mirror planets were particular favorites of mine. Stupidly, however, I hadn’t counted on there being so much physics! I frequently found my eyes glazing over during these sections, which were unfortunately clustered near the beginning (making it hard to get started) and end (causing a strong urge to set the book down with only forty pages to go) of the book. M-theory’s main thrust is to generalize the one-dimensional objects of string theory into p-dimensional objects known, amusingly enough, as p-branes (where setting p = 0 gives a particle, p = 1 gives a string, p = 2 a “membrane,” and so on). Seriously, is that plain English? I note that Parsons did not bother to define “p-dimensional,” though that probably wouldn’t have been much help to me anyway. In the end, I did learn some interesting things. In the chapter on Cybermen, for example, I learned that a cybernetic brain implant currently exists that can block the signals that cause Parkinson’s disease. That’s pretty awesome! I also now know that Sontarans reproduce by cloning and it takes only ten minutes for their offspring to reach adulthood. That’s less awesome. I’m glad I didn’t give up on reading The Science of Doctor Who but now I think I’ll give my brain a rest by actually watching some. I think there’s a big difference between ‘plain English’ and ‘understandable, enjoyable, educational way of explaining things’. And he definitely did not have that. I guess I enjoyed best the sections that didn’t require much explaining, because it’s true, some of his examples just went right over my head. That thing with the lottery balls to demonstrate eternity? Eh? At that point I just went, “Whatever” and kept on reading. Yeah, that quote is not the best. I found the level of science in the articles (I just can’t bring myself to call them chapters) pretty uneven. There were several where it was almost a thought experiment rather than actually presenting any sort of scientific evidence. And then others where he got into things like p-branes. There were also a couple of occasions where I thought, “Why is this even in here?” Did we need a scientific explanation for the Doctor’s altruism or why he brings companions along? And he brings companions along so he has someone to explain things to! They’re his Watson. No scientific explanation needed.